CD336, also known as NKp44, is a 44-kDa transmembrane glycoprotein which is selectively expressed by activated NK cells. NKP44 functions as a triggering receptor involved in non-MHC-restricted natural cytotoxicity by activated NK cells and is one of the NK natural cytotoxicity receptors (NCRs). Structurally, CD336 is a member of the immunoglobulin superfamily characterized by a single extracellular V-type Ig-like domain. It associates with a homodimer of ITAM motif-containing KARAP / DAP12 adaptor proteins. These adaptor proteins were found to be crucial both for the surface expression of NKp44 and for transducing activating signal. 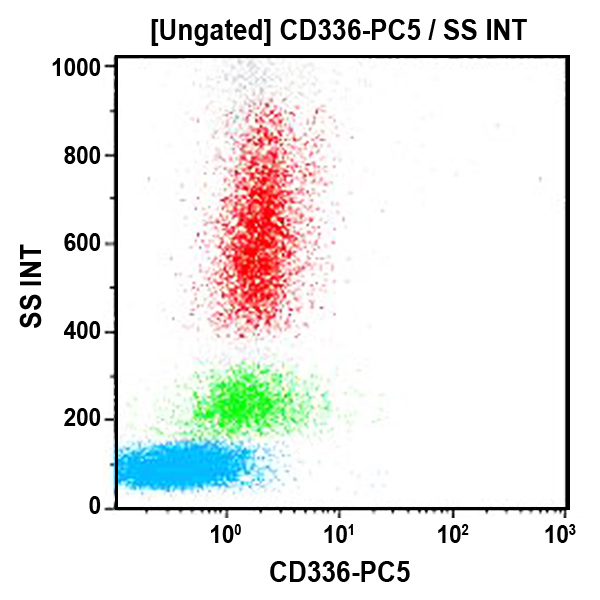 CD336 can mediate triggering of NK cell cytotoxicity as in redirected killing assays. Monoclonal antibody Z231-mediated cross-linking of NKp44 in cloned NK cells resulted in strong lysis of target cells and, Z231-mediated masking of NKp44 partially inhibits cytolytic activity. Such inhibition is greatly increased if an anti-CD335, also known as anti-NKp46 (BAB281), is combined with Z231. The CD336 ligand is still undefined. Since activated NK cells selectively express NKp44, it may play a partial role in the enhanced cytotoxicity of IL2-activated compared to those freshly isolated NK cells from peripheral blood.